Adhesives can be tricky sometimes. We’ve put together this list of the best glue to use on leather to cut the frustration and make your crafting a little bit easier! If you’ve found yourself unable to get leather to stick to anything, we’ve got your back! We’ve done our research so we could present you with the top ten adhesives that work with leather, to help repair and create things! Application: How does it go onto the material? There are two main applications on our list; either the glue is squeezed out of the top of the tube, or it’s brushed onto the fabric with the attached brush. Package Size: How much adhesive are you getting? Sometimes you’re going to have a lot of leather to glue, so you’ll need a larger size. Why go for several smaller tubes when you could go with one large one? Fast Set: Some of these glues come with a fast setting system, which means that it gets tacky and adheres very quickly. It still might take some time to dry, but the materials will be bonded together quickly. Waterproof: Once the glue is set and dried, is it waterproof? If you’re gluing shoes or clothing, you want to make sure that the glue doesn’t come undone again if it rains or you have to wash it. Multi-Purpose: Can the glue be used on multiple different surfaces? Some glues are specifically for leather, but sometimes you can also use the adhesive for fabrics, plastics, and vinyl as well. Make sure you check this for more than leather! Made in the USA: Where is the glue made? For some people, supporting businesses in the US is one of the most important considerations when purchasing a product. We’ll let you know if it was made in the USA or not. Now that you know all about shoe glue, we can get to the reviews! These are the best, most effective adhesives to get your leather to stick! Our top pick and budget picks are our favorites and the highlights of the list. If you’re in a hurry, check these out first. Otherwise, stick around and take a look at some of the other glues on our list. You’ll be glad you did! 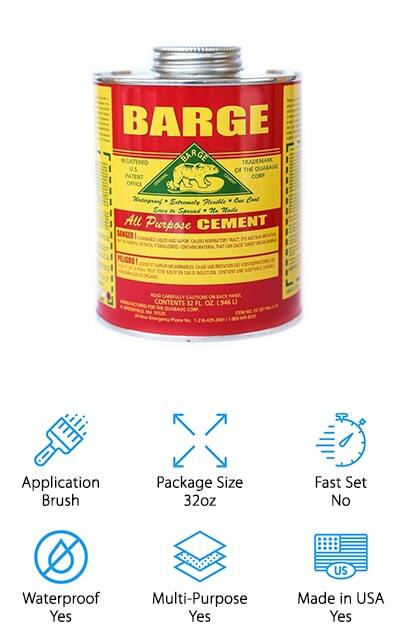 Our choice for the best glue for leather repair is this multipurpose adhesive by Barge. It’s an all-purpose cement-type bonding agent that will stick just about anything together. And you can stick a lot of it with this bottle because you get an entire quart of glue. You can use it on rubber and vinyl as well! If you need to patch rubber boots or add new soles to leather shoes, this is the adhesive for you. It also works on such materials as wood, metal, plastic, plaster, paper, and even concrete. There’s almost nothing that this adhesive won’t stick, and that’s pretty amazing. The can itself comes with a brush attached to a lid so you can brush it right onto the materials. After it dries, they’ll be bonded together! We love that you get so much glue and that you can use this professional strength adhesive on just about anything. It’s even waterproof! 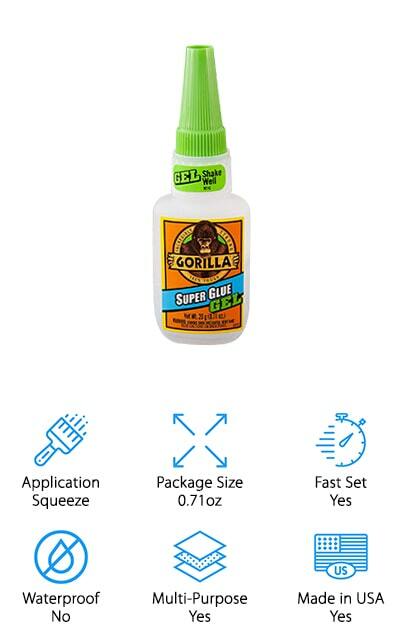 Gorilla Glue is one of the most popular affordable adhesives you can buy! This is a smaller squeeze bottle, but a little bit of this glue goes a long way. For smaller repairs, this is the glue that you should go with. The cap won’t clog up with glue, which prevents the rest of the glue in the tube from drying out slowly. It sets quickly, so makes sure you know where you want it! 10 to 30 seconds after application, your materials should be bonded together. After it dries, it’s set for a good long time! It’s versatile, water-resistant glue that is actually one of the best glues for leather to metal. In addition, it can be used to bond ceramics, rubber, paper, wood, and plastics. You get a tough formula that won’t run and can handle a little bit of water. It’s good to use even on vertical surfaces, so you can bond almost anything! Boot-Fix is one of the best glues for leather shoes – or, indeed, any shoes that need fixing! It creates an almost instant bond to fix the parts of your footwear that’s worn or falling apart. Unlike some other shoe glues, it won’t expand or dry too thick and create an uncomfortable feeling. The bond is flexible and isn’t going to be damaged or weakened by any temperatures or moisture. Plus, it won’t discolor the leather or the shoe. You can use it on vinyl as well as a variety of dress shoes, athletic shoes, boots, and even hiking or climbing shoes. All of your footwear can go through some minor repairs with Shoe Glue. This adhesive is going to last! Why take your shoes to be repaired professionally when you can get the tools to do it yourself? That’s what Shoe Glue by Boot-Fix gives you the confidence to do. We’re sure you’re going to love it! 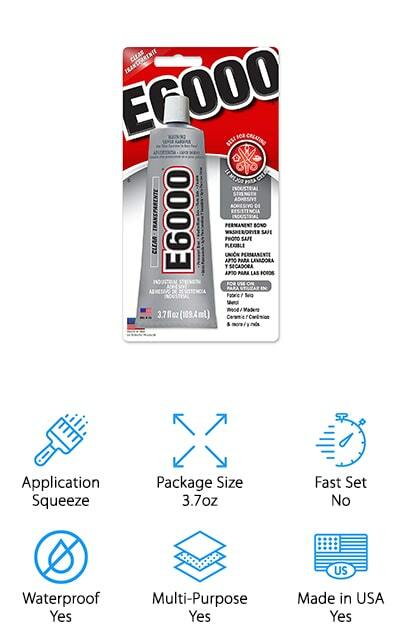 This E6000 Craft Glue works well when you’re trying to bond just about any applicable material. It works well with glass, wood, different types of plastics, ceramics, cement, rubber, fabric, and vinyl. In fact, it’s one of the best glues for leather to leather because it bonds so incredibly well. It dries clear so you can paint it if you want. It’s temperature resistant so you can use what you make in all different conditions. When it’s dried, it’s not flammable either. That’s great! It’s also waterproof once the bond is completely formed and dried. 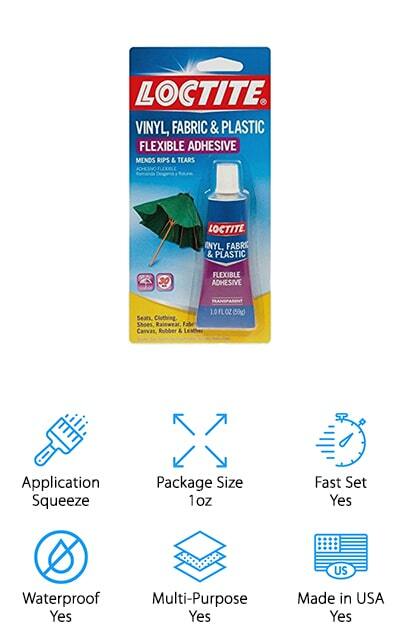 For all of your crafts, this is one of the best adhesives that you can get to make sure that things stay stuck together when you want them to. We love that you can use your finished product in any different condition, temperatures, and even in the washer and dryer. It’s perfect for smaller or wearable crafts, as well as shoes. 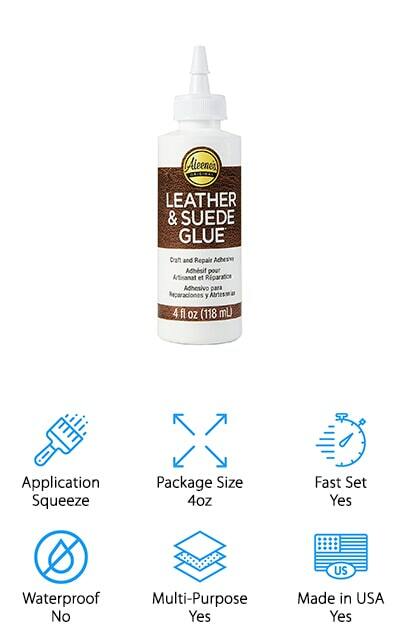 If you’re looking for a glue that specifically bonds leather and suede to other materials, Aleene’s Leather Glue is for you! It’s great for leather repair, and in fact, that its main purpose. It’s the best glue for leather belts and purses when they need to be repaired. Once you’ve used this glue to repair your leather, it should be dry-cleaned to maintain the bond. Otherwise, you can use it for crafts as well as for repairs. They even offer a handy website where you can learn all about how to use the glue as well as the different projects you can create with it. It’s the fast-setting glue that will immediately bond the materials, though the process won’t be complete until it dries. The 4-ounce bottle is great for smaller projects, and a little goes a long way! This glue will do just about anything you need it to, and we’re sure that you’re going to love it. 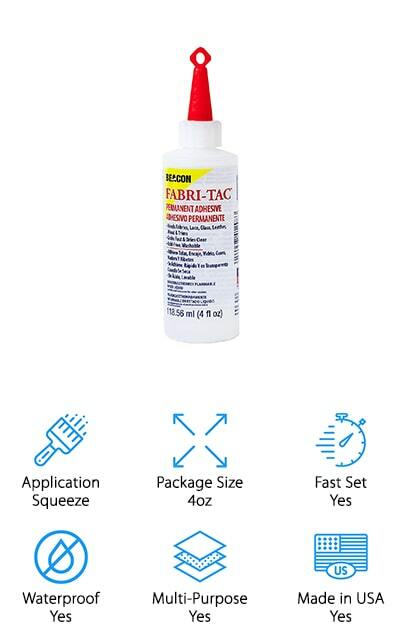 Fabri-Tac is one of the best glues for leather and fabric. It’s formulated specifically for leather, wood, and lace so that you get the strongest bonds even to these fabrics. You can use it for quick repairs as well as craft projects and décor. It’s a fast-setting, fast-drying formula that’s going to grab onto your material and keep hold of it, so make sure you put it exactly where you want it! It won’t stain your fabrics and it is thick enough that it won’t soak in and make them tacky, either. This bottle comes with 4 ounces of Fabri-Tac adhesive, which is going to be plenty for repairs and smaller jobs. It’s a crystal adhesive that dries clear and can even be used on wearables! It’s waterproof but not recommended for a dry cleaner. We love the versatility of this formula and how well it works to bond a variety of materials quickly and easily. 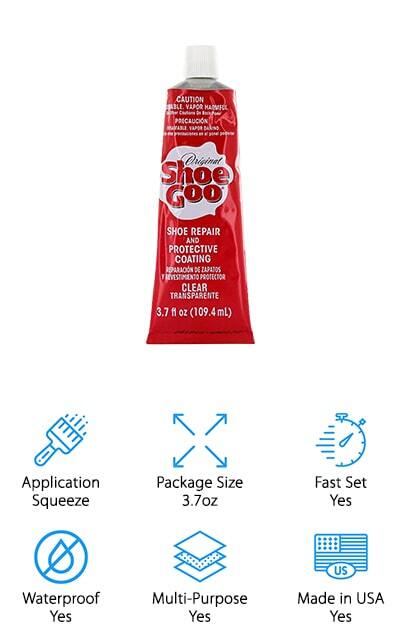 Shoe Goo is a great repair for leather shoes, but it also works on leather, rubber, canvas, and vinyl. You can also use it as a protective coating to keep your shoes from becoming damaged to the point that you need repairs. That’s amazing and unique on our list! The repair and protection that this adhesive offers are permanent and waterproof. You can use it for sealing even small holes in addition to reattaching soles and other loose pieces. Even when it’s submerged and exposed to water, the bond between materials won’t weaken or let go. It’s a squeeze bottle that comes in a 3.7-ounce package – enough glue for small repairs and some light coating. It’s a pretty amazing synthetic compound that you can use for just about anything – also making it the best glue for faux leather on our list. It even bonds canvas, which is pretty impressive in comparison to some other glues. Tear Mender’s Instant Adhesive is one of the best glues for fabric to leather. It dries not long after it is applied, and the bond that it forms can be machine washable, completely waterproof under any conditions, and flexible enough to stand up to being worn. Plus, you can also dry clean it! In addition, the glue is resistant to UV and non-flammable, as well as being non-toxic. What more could you want? It’s an all-natural adhesive that’s permanent and extremely versatile. They boast over 101 different uses, and you can use it for vinyl as well as for leather and fabric. You can use it indoors and outdoors for a huge variety of applications, and we definitely appreciate that. 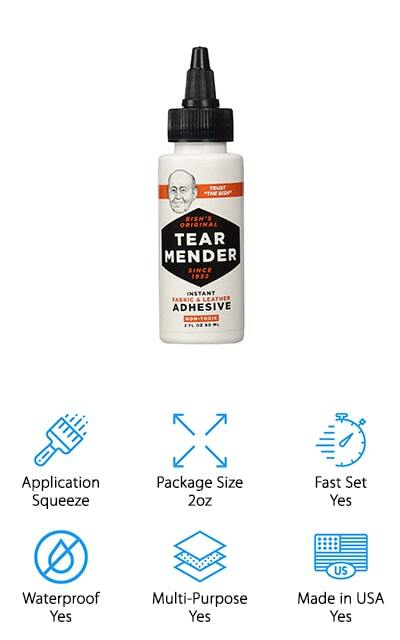 When you’ve got something to fix, reach for your Tear Mender to get the job done right the first time, and for good! The permanent bond that it creates works for so many porous materials. LOCTITE is a great glue for bonding all types of materials. It’s a clear liquid that dries just as clear, which makes it great for outdoor gear, vinyl seats, and cushions. It’s flexible and waterproof so nothing is going to cause this adhesive to break. It’s a great barrier that will be great for repairing even items that need to be used in water, like beach balls, raincoats, and even inflatable mattresses. Nothing can get through this Loctite glue! It sets in about 10 minutes, so make sure that you’re putting it right where you want it. Within 24 hours, it will be completely cured and secure, and ready for use! It won’t yellow or brittle with age, which is a nice feature that often goes underestimated for adhesives. The clear liquid also means that it can be painted and used for texture work in crafts. What more could you ask for from a multi-purpose bonding agent? 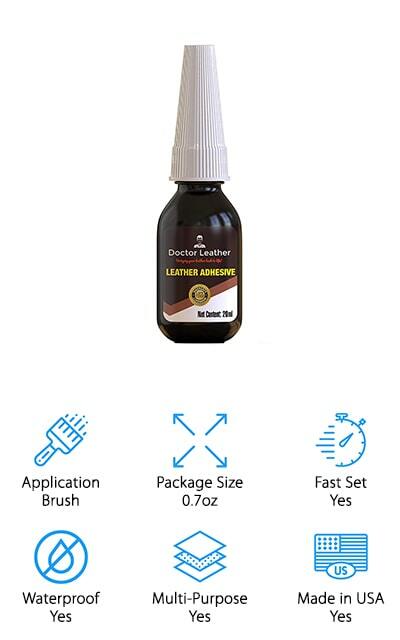 Doctor Leather makes one of the best adhesives on our list. It’s a non-toxic glue that won’t come off when it’s dry. It’s flexible enough for fabric or vinyl and strong enough to bond leather and PU plastic materials together. Plus, you can restore and repair your items – it’s not just a sealant or an adhesive. It works as much more than that. If you’ve got leather furniture that’s peeling away, you can apply this to the area and it will start to look amazing again. This glue is incredibly multi-purpose and affordable as well. The bond that it creates between the materials is waterproof and strong. You can apply it using whatever method you prefer – from cloth, paint brush, or sponge! Plus, it sets and dries in minutes without having to use any heat at all. That’s quality! It’s non-flammable and resistant to UV rays as well. Nothing is too big a job for this glue.